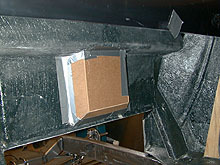 The newly formed box was then taped in place from behind and checked for alignment. Here is a view from behind the firewall. 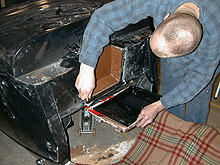 The duct tape will be removed once the outer resin is dry. 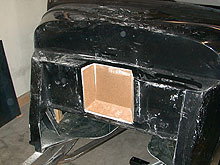 We will then fiberglass over all of this to strengthen and blend the new form into the existing firewall. We will cover this also with another article. 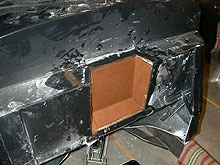 A piece of fiberglass cloth was then cut to fit our opening with an additional 3/4 inch along all the outer edges. 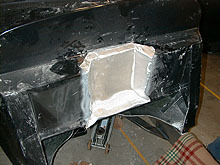 The surrounding fiberglass needs to be scuffed up in order to get a decent bond with the new fiberglass resin. 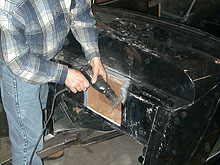 To do this I used a paint stripping brush on a drill. We mixed up the resin in a disposable paint pan for easy cleanup. Resin was then brushed on the masonite. We laid a board below to catch the runoff. You could see the resin soak into the masonite. This will help strengthen the wood. Once a nice coat of resin was applied we carefully placed the cloth over the top and started smoothing it in place with a piece of cardboard and the brush. The disposable paint pan worked well for this also, catching the runoff as we worked. We hopefully will be finishing the backside tonight so watch for more articles coming soon.